Kootenai County Farmer’s Market Opens Saturday! The kick-off to gardening season begins this Saturday, May 11 with the opening of the Kootenai County Farmer’s Market. The market, a non-profit organization, has been serving Kootenai County for 27 years – bringing the best in locally grown plants, vegetables and fruits to area residents. There are actually three market days/locations this year: 1) the Saturday market at the corners of Hwy 95 and Prairie Ave. in Hayden (9a to 1:30p), 2) the Wednesday market at 5th St. and Sherman Ave. in downtown Coeur d’Alene (4 to 7 p), and 3) new this year, a Thursday evening market at the Hayden City Hall in conjunction with the evening park concerts. It’s always been a rite of spring for me, so I’ll be there on Saturday to scope out what my fellow vendors are selling. Last year I joined the group and sold heirloom tomato plants and spring produce at the Wednesday Market — and yes, I’ll be back again this year! Please visit me on Wednesdays for a great selection of heirloom tomatoes…including some unusual varieties! Spring arugula — perfect for salads or a saute! While I’ve been busy getting ready for Farmer’s Market, I’ve also managed to get my own garden underway. Since I grow “year-round” with the help of covered raised beds, I have been harvesting lettuces, spinach and arugula for weeks (okay, months). These beds have all been turned over and now are home to my heirloom tomato plants. 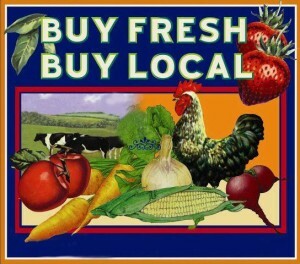 I grow every variety that I sell, so you get first-hand local knowledge on each type. With the incredibly nice 80 degree weather, and the all-important nighttime temperatures above 50 degrees, I have put my tomato plants in the ground. Yes, it could be a bit risky since the last average day of frost is May 15th; but I think the worst is over. These early warm days will definitely bolster the young plants, should we (or rather, when we) drop back down to cooler temperatures. So far all the heirlooms are doing great and this little jump on the season (about a 10 days early) should make for a nice tomato harvest later this summer. The “lettuce and tomato” box. Where’s the bacon?? I’m trying something new this year for mulching around the tomatoes and garlic — edible mulch! With such a small garden footprint, it’s not unusual for me to cram as much as possible into my raised beds. This year, I’ve found a way to have my mulch and eat it too! 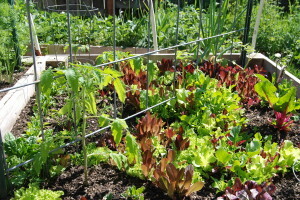 Lettuces and arugula are sprouting between the rows of garlic and around my tomatoes. This delicious mulch will help keep the soil cool and weeds down, plus I get an extra harvest in space that was basically unused. Bonus! Helen (Rhode Island Red) and Madge (Buff Orpington) are 5 and 4 years old respectively. The chicken girls came through the winter in fine shape. In fact, the two “old girls,” Helen, who is now 5, and Madge, who is 4, are in super condition. Madge still pumps out eggs, but I have noticed that Helen has really slacked off. No worries though, these two girls have earned their keep and will remain with us regardless of their output. The other three (a.k.a. Marigold 1, 2, and 3) decided that they needed a new spring wardrobe and went through a mini-molt in early April. I was a bit concerned at first, since everyone had a thorough molt last fall; it was the first spring molt in our coop. But with a little research, I learned that it does happens and is completely normal. Unfortunately, the stress of molting got the better of Marigold #3, as she became the object of intense bullying. I’ve said it before, but there is nothing so brutal as two chickens attacking a third. Bloody hell. Luckily, this has a happy ending, as one of The Coeur d’Alene Coop followers agreed to “adopt” M#3. She is now living out her days in the country with a lovely flock of Buff Orpingtons (thanks again, Clair!). Please let me know how your garden is shaping up and what you are planting this year – especially if you are trying anything new! Remember, if you need heirloom tomato plants, I have them. They are available from my home garden or see me at the Wednesday Farmer’s Market!